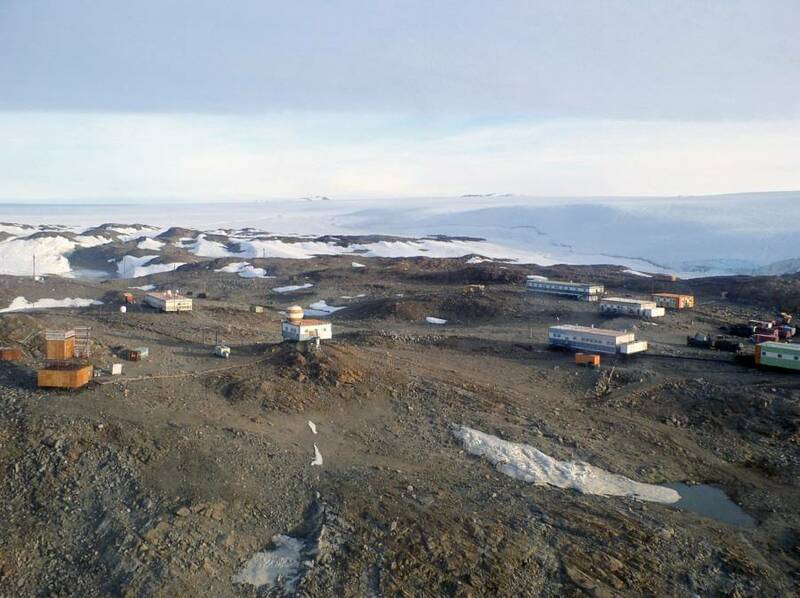 When Russian explorer Leonid Rogozov needed an appendectomy in the middle of Antarctica, he was the only doctor on site. So he did it himself. 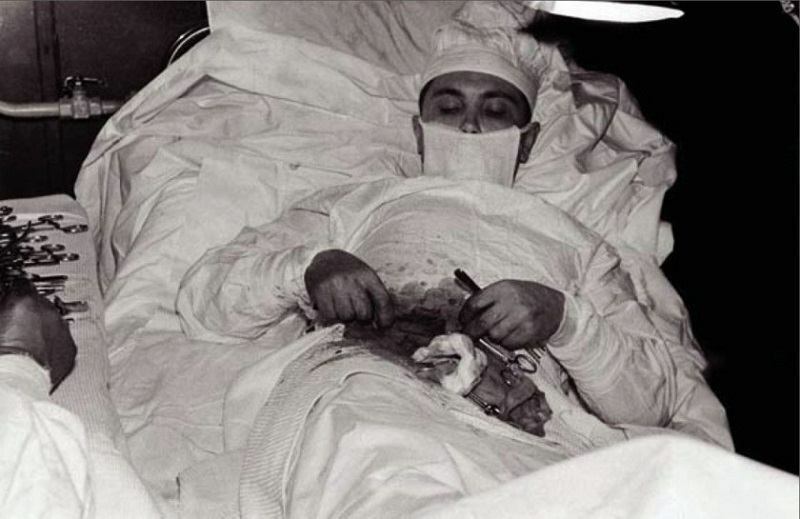 History DailyRussian doctor Leonid Rogozov performs surgery on his own appendix. History is filled with remarkable true survival stories — yet few can match that of Leonid Rogozov, the Russian doctor who performed surgery on himself to save his own life. It was 1961 and the Cold War was in full swing. Leonid Rogozov was a member of the 12-man Soviet Antarctic expedition sent to build a research base at the Schirmacher Oasis. Once the base was completed, the 27-year-old Rogozov would stay on to serve as the scientists’ doctor, hunkering down with the team to wait out the winter months until a ship or plane could reach them again in the spring. But by the evening of April 29, it was starting to look like Leonid Rogozov might not live to see it. He had woken that morning feeling queasy, weak, and ill at ease — flu-like symptoms he might have dismissed had he not also noticed a strange pain in the right side of his abdomen. The severity of the pain and the localized swelling, he thought, could only mean appendicitis. It was a grim prognosis; as the only medic on site, he would be helpless if his condition worsened. An antibiotic treatment, effective in some mild cases, would simply have to be enough. But it wasn’t. By the following day, Leonid Rogozov was in severe pain. The panicked researchers had done everything they could to make him comfortable, and they had tried to call for help to other countries’ Antarctic research teams — but a gathering storm made it impossible for them to send help. 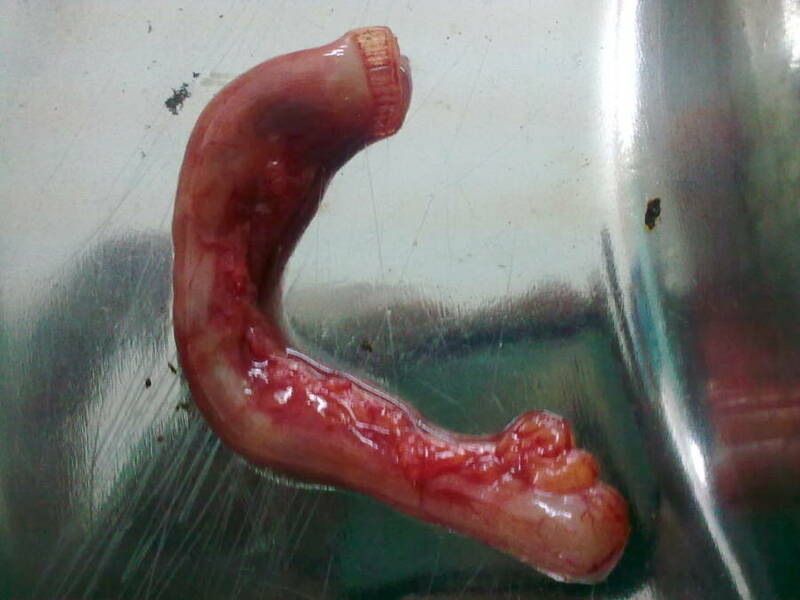 Rogozov’s appendix was ready to burst in the middle of the polar winter. If it ruptured, he would die. There was only one option left. Wikimedia CommonsThe Novolazarevskaya station in Antarctica, where Leonid Rogozov was stationed when he contracted appendicitis. He knew that self-surgery was possible, as there were several well-documented accounts of successful operations. A German doctor named Werner Forssmann had been so determined to try his dangerous experiment, cardiac catheterization, that he had performed it on himself — and won a Nobel Prize. Then there was the surgeon Evan O’Neill Kane, who had, more relevantly, chosen to remove his own infected appendix out of what he would later describe as a curiosity about the effectiveness of local anesthetic. He had been successful, and he was so encouraged by the results that he tried to repair his own inguinal hernia. That didn’t go as well. But in every case of self-surgery Leonid Rogozov knew of, the surgeon had performed his operation in a controlled medical environment — and all had been assisted by a team of medical professionals. What he proposed to do was something else entirely. The clock was ticking; if Rogozov’s appendix burst, its bacteria would flood his abdomen, raising the risk of septicemia. If that happened, it would only be a matter of time before his body went into sceptic shock. At that point, surgery would no longer be an option; he wouldn’t be mentally capable of it. He would be left counting the minutes until his organs finally failed. Wikimedia CommonsA removed human appendix. So with no better option than to wait for death, Leonid Rogozov called in a makeshift team: a driver, a meteorologist, and a third scientist to act as a stand-in should either of his other assistants be overcome by nausea. He showed them how to sterilize the instruments, then directed them to set up a mirror just below his right hip. At his urging, they pointed a table lamp at his swollen abdomen. With no time to waste, he injected a local anesthetic and made the first incision. It didn’t go as planned. As he started to move his intestines to get to his appendix, he found the mirror’s inverted image disorienting. He made a mistake and sliced his lower intestine, which he then had to suture. After that, he abandoned the mirror and gloves, working primarily by feel. He made it just in time. From opening incision to final suture, the surgery took nearly two hours. Leonid Rogozov returned to his normal duties as a member of the team two weeks later. 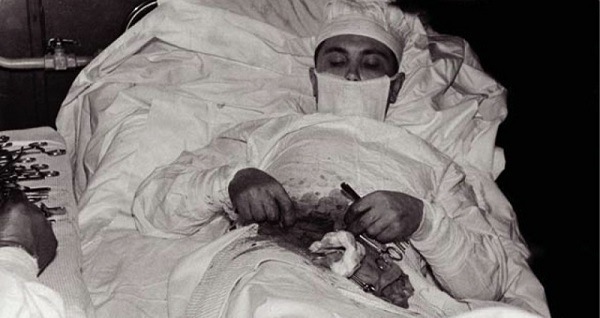 Next after reading about Leonid Rogozov, the Soviet doctor who removed his own appendix, check out some survival tips we hope you’ll never need to use, and some more amazing survival stories.